Edge and cloud computing are seeing rampant growth, causing the build-out of new data centers both large and small, with growth coming so fast that traditional approaches to construction and management are unable to keep up. The need to minimize OPEX and CAPEX costs while increasing the efficiency of the data center is causing a drive towards consolidation, virtualization, containerization on the compute side, while the increasing number of both data sources and data consumers is driving the growth in demand for storage capacity. Big data, AI/ML/DL, Internet of Things (IoT) and other new types of workloads are placing increasing demands on most data centers and networks. Specialized silicon is now being deployed in many data centers, with the intent of improving throughput and latency in support of the new workloads. FPGAs and ASICS for AI, GPUs for AI and cryptocurrency mining. 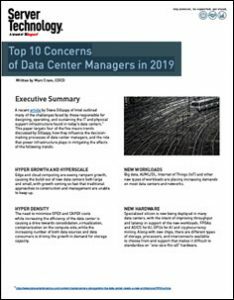 Download the full report from Server Technology to learn more about what these trends mean for the industry and what is top of mind for today's data center managers.